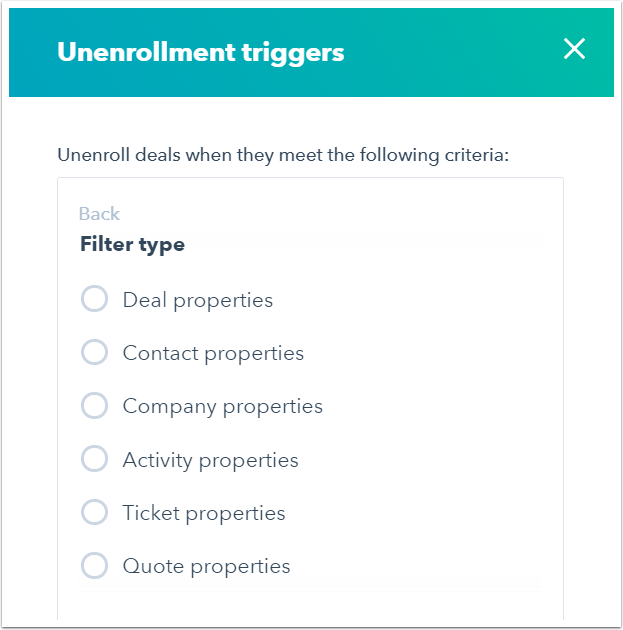 Set unenrollment triggers to unenroll or exclude objects in company-based, deal-based, ticket-based, or quote-based workflows. If you have a Marketing Hub Professional or Enterprise account and are trying to unenroll or exclude contacts in a contact-based workflow, learn how to use suppression lists. If you are a Sales Hub or Service Hub Professional or Enterprise user and are trying to unenroll or exclude contacts in a contact-based workflow, learn how to set workflow goals. Company/deal/quote/ticket is not currently enrolled in the workflow and meets the unenrollment triggers: the company/deal/quote/ticket will not be enrolled in the workflow even if they meet the enrollment triggers at a later time. Company/deal/quote/ticket is currently enrolled in the workflow and meets the unenrollment triggers: the company/deal/quote/ticket will be immediately unenrolled from the workflow. Company/deal/quote/ticket is currently enrolled in the workflow and does not meet the unenrollment triggers: the company/deal/quote/ticket will remain in the workflow. However, if it meets the unenrollment triggers at a later time (while still active in the workflow), it will be unenrolled then. 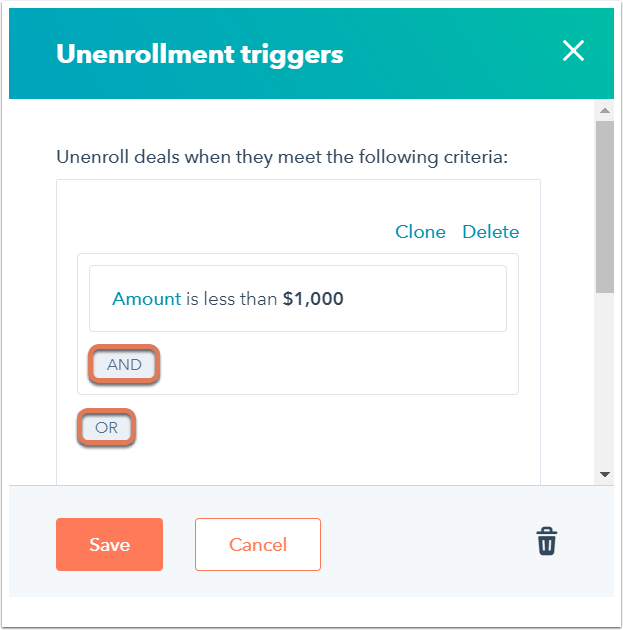 Please note: a company/deal/quote/ticket that no longer meets a workflow's unenrollment triggers will not automatically be enrolled in the workflow even if they still meet the workflow's enrollment triggers at the time. A company/deal/quote/ticket is only enrolled in a workflow at the moment it meets the workflow's enrollment triggers or re-enrollment triggers. Click the name of the workflow. In the right pane, set an unenrollment trigger. For example, in a deal-based workflow, you can select Deal properties | Amount | is less than | 1,000 to unenroll or exclude deals with amounts less than $1,000. To add multiple unenrollment triggers, click AND or OR. Learn more about AND vs OR criteria. After setting your unenrollment triggers, click Save.